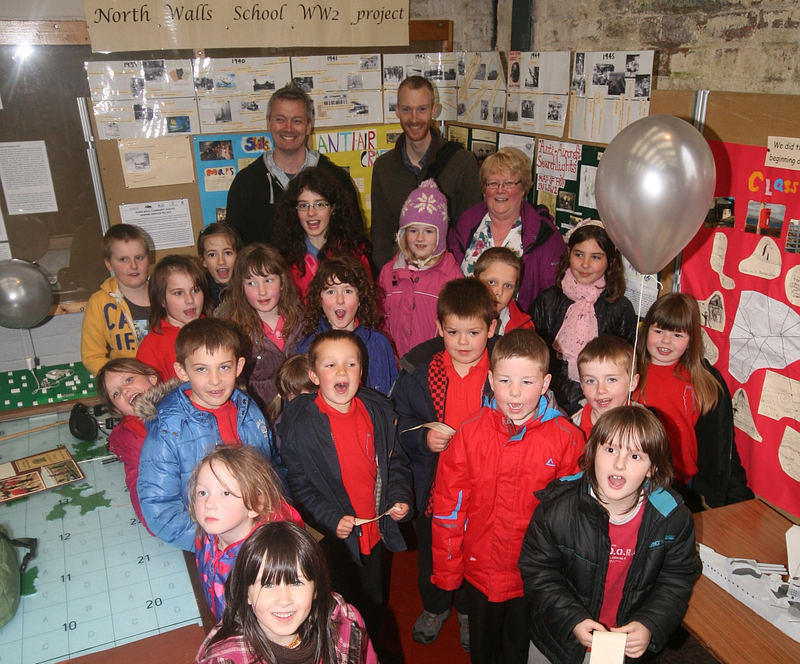 The North Walls Community School (NWCS) Project was conducted between 19th February and 2nd May 2014 with a 3 week break over the Easter school holiday period and an exhibition launch of the pupils’ work on 21st May. 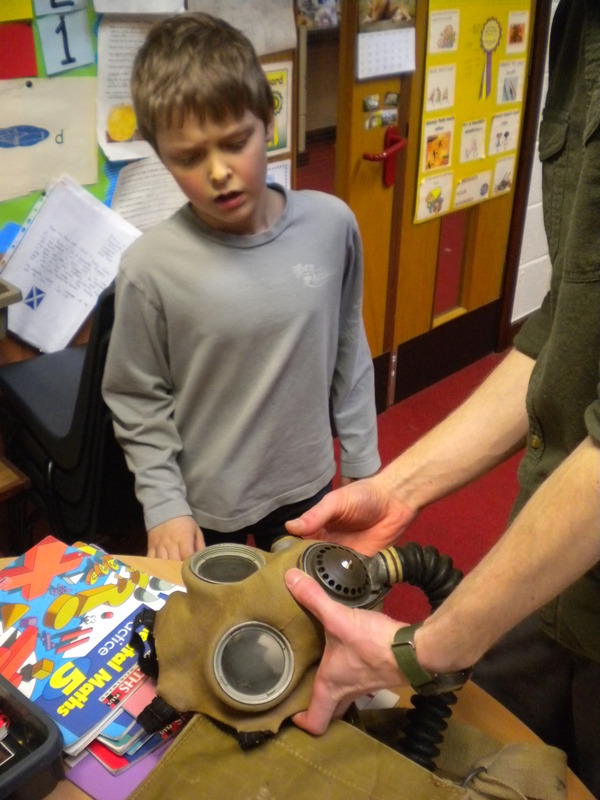 The teaching programme involved the delivery of 16 lessons of 90 minutes taught two days a week over 8 weeks during which the pupils learnt and then applied archaeological skills to the investigation and interpretation of the wartime landscape surrounding their school. The Project involved teaching the full school compliment in a single, combined class of 20 pupils with an age range of 5-11. The principal author led the combined class in practical field and classroom based lessons with both classroom teachers present at all times and serving in a facilitating and disciplinary role. 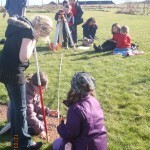 During field based lessons a further member of staff was also in attendance. Both the teaching and support staff of NWCS have been incredibly encouraging and enthusiastic from the outset volunteering significant time and resources to the delivery of the project. 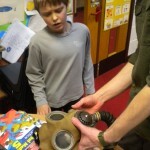 The lessons were formatted to enable young people’s perceptions of wartime heritage to be evaluated whilst also assessing the potential of WWII archaeological sites as educational resources. 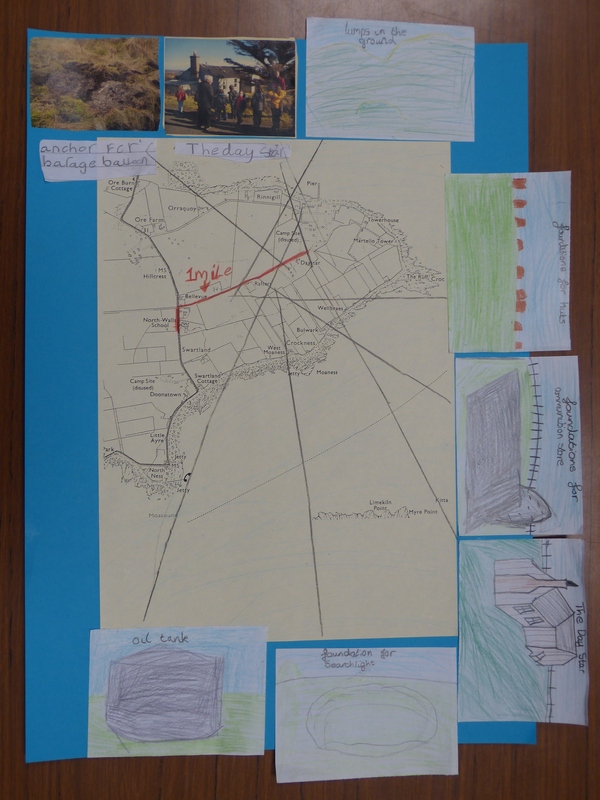 In order to achieve these goals the project was structured around a baseline and end point assessment exercise which involved the pupils walking a predetermined route along the road leading to Rinnigill passing WWII archaeological sites close to the school. Very little informative input was offered by the teaching staff during these exercises and the pupils were provided with paper, stationery and cameras and encouraged to draw, write about or take photographs of anything along the route that they found interesting. 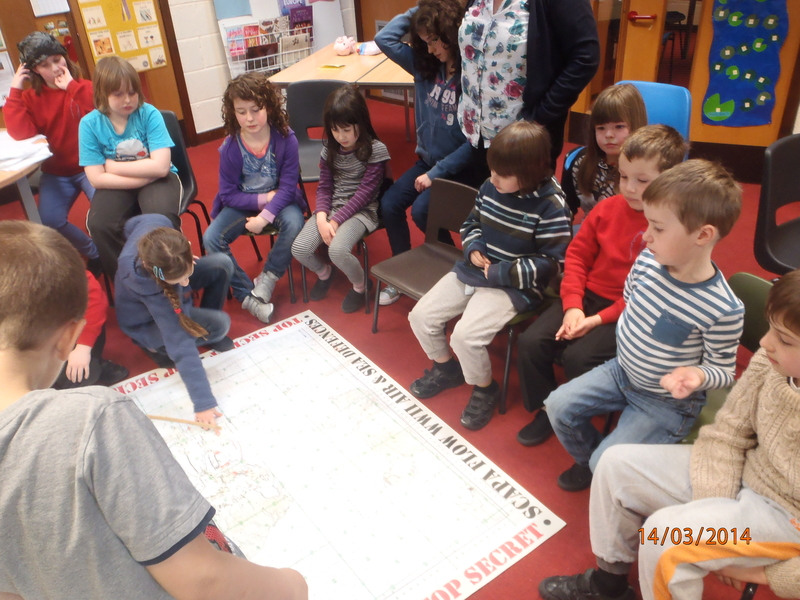 Back in the classroom after the walks the pupils were tasked with creating posters based on their field records illustrating the route taken and what they had observed. Class 1 (the younger pupils) produced combined class Baseline & End Point posters and Class 2 pupils created individual posters or worked in pairs. 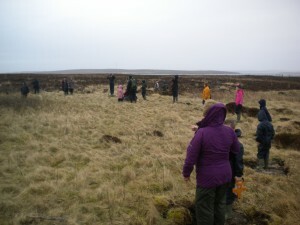 The core lessons that were laid out between the evaluation exercises were a variety of classroom sessions including historical document & photograph research, presentations and practical activities relating to specific wartime themes and field-based lessons including archaeological surveying, recording and artefact investigation. 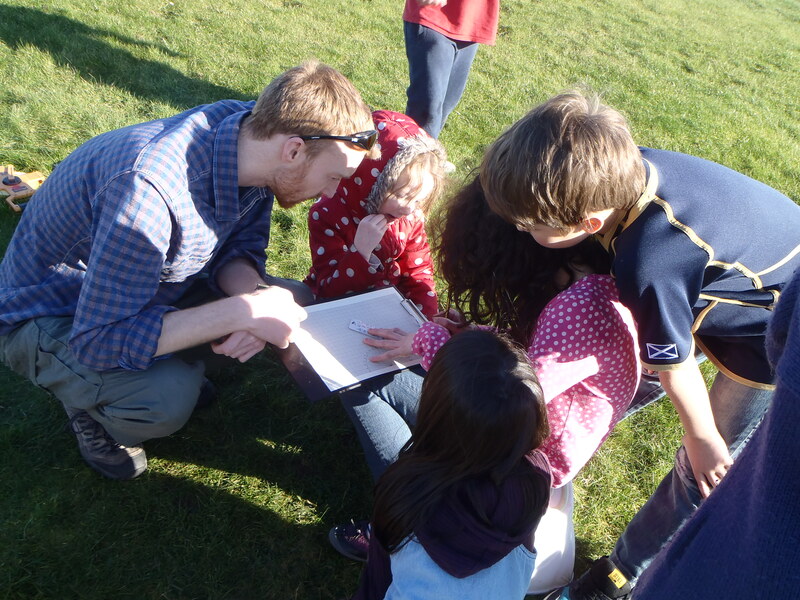 The intent of these lessons was to develop a new set of observation skills and knowledge base which the pupils could use to investigate, interpret and engage with the landscape around them. Archaeology was introduced as a form of detective work with topographic features, standing buildings, artefacts and historic documents serving as clues to what may have happened in the past. 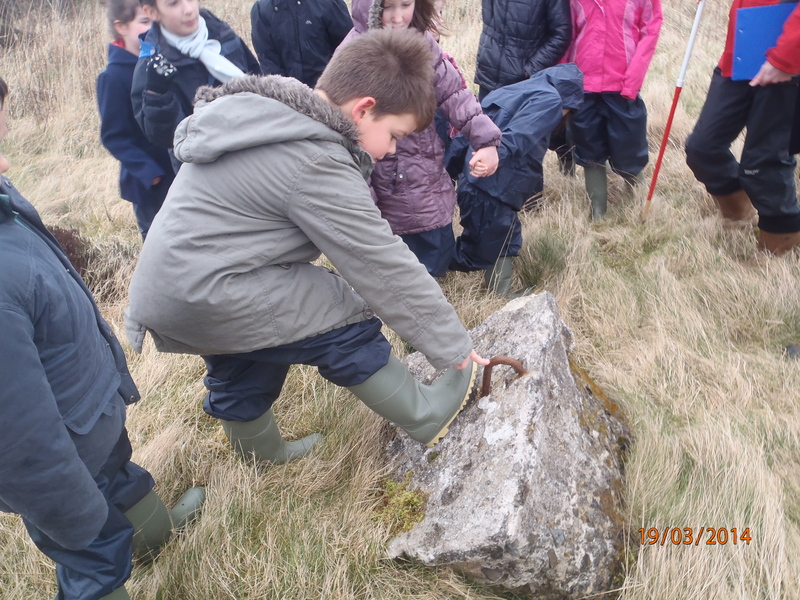 The pupils were directed towards the archaeological remains of an anti-aircraft searchlight battery (HY72) and a barrage balloon site (NMRS: ND39SW 72) on a second walk of the baseline evaluation route where they had the opportunity to utilise their recently acquired ‘detective’ skills. The subsequent lessons used the remains discovered and recorded by the pupils at these sites (searchlight emplacement, anti-aircraft light machine gun emplacement, hut bases & balloon anchor points) to inform further learning about Hoy’s role in WWII. Complex concepts such as depth of time, measuring, descriptive writing, poster presentation, personal & group research, local & European geography, weapons technology (i.e. how barrage balloons, searchlights & anti-aircraft guns work), the origins of WWII and World conflict were all covered. A significant contribution to the project came from Mr Jim Sinclair, a past island resident who had spent periods of his childhood living along the road being researched by the pupils during WWII. Travelling up from the south of England to attend two of the project sessions, Mr Sinclair generously guided the pupils on a walk past many of the sites he remembered, sharing stories and answering questions about what it was like to grow up and attend school during WWII. 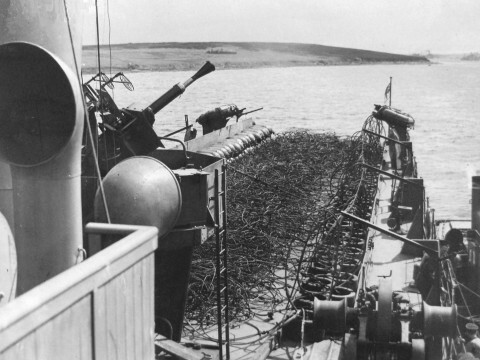 The learning experience was also augmented by a visit to the nearby Scapa Flow Visitor Centre & Museum (SFVC&M) to conduct further research using the wartime collections held there. 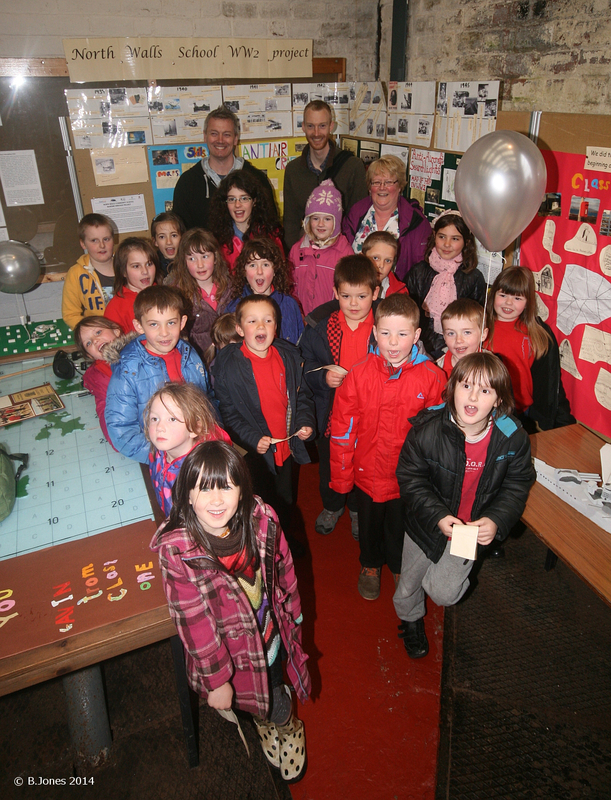 The teaching elements of the school project concluded in the first week of May and three weeks later a summer exhibition was opened by the pupils at the SFVC&M where representatives from both Class 1 and Class 2 summarised the project and their findings to an audience of 30 visitors, island residents and proud parents. 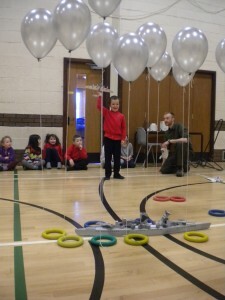 With such a varied interdisciplinary approach, the school project was perfectly suited for the Scottish Curriculum for Excellence (CfE) and successfully covered 38 experiences and outcomes across 7 curriculum areas providing opportunities for pupil development in all four capacities of Successful Learners, Confident Individuals, Responsible Citizens and Effective Contributors (see table for more details). 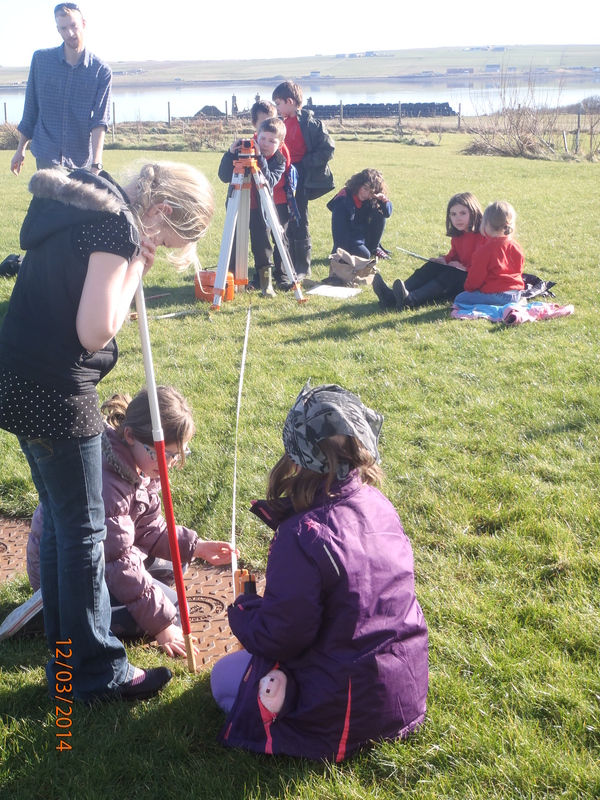 The project also incorporated outdoor and active learning with 50% of the pupil contact time taking place outside of the classroom. I have experienced the energy and excitement of presenting/performing for audiences and being part of an audience for other people’s presentations/ performances. EXA 0-01a I have experienced the energy and excitement of presenting/performing for audiences and being part of an audience for other people’s presentations/ performances. EXA 1-01a I have experienced the energy and excitement of presenting/performing for audiences and being part of an audience for other people’s presentations/ performances. EXA 0-02a I can create a range of visual information through observing and recording from my experiences across the curriculum. In everyday activity and play, I explore and make choices to develop my learning and interests. I am encouraged to use and share my experiences. HWB 0-19a Through taking part in a variety of events and activities, I am learning to recognise my own skills and abilities as well as those of others. I enjoy exploring events and characters in stories and other texts, sharing my thoughts in different ways. As I listen and talk in different situations, I am learning to take turns and am developing my awareness of when to talk and when to listen. I listen or watch for useful or interesting information and I use this to make choices or learn new things. LIT 0-04a As I listen or watch, I can identify and discuss the purpose, key words and main ideas of the text, and use this information for a specific purpose. To help me understand stories and other texts, I ask questions and link what I am learning with what I already know. LIT 0-07a / LIT 0-16a / ENG 0-17a I can select ideas and relevant information, organise these in a logical sequence and use words which will be interesting and/or useful for others. I use signs, books or other texts to find useful or interesting information and I use this to plan, make choices or learn new things. LIT 0-14a I can show my understanding of what I listen to or watch by responding to and asking different kinds of questions. I can communicate clearly when engaging with others within and beyond my place of learning, using selected resources as required. 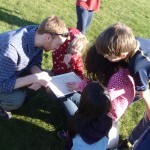 I am developing a sense of size and amount by observing, exploring, using and communicating with others about things in the world around me. I am aware of how routines and events in my world link with times and seasons, and have explored ways to record and display these using clocks, calendars and other methods. 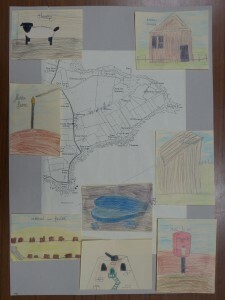 I can collect objects and ask questions to gather information, organising and displaying my findings in different ways. MNU 0-20a I have carried out investigations and surveys, devising and using a variety of methods to gather information and have worked with others to collate, organise and communicate the results in an appropriate way. I have developed an awareness of where grid reference systems are used in everyday contexts and can use them to locate and describe position. MTH 1-18a I can accurately measure and draw angles using appropriate equipment, applying my skills to problems in context. Through practical activities which include the use of technology, I have developed my understanding of the link between compass points and angles and can describe, follow and record directions, routes and journeys using appropriate vocabulary. Having investigated where, why and how scale is used and expressed, I can apply my understanding to interpret simple models, maps and plans. SOC 0-01a By exploring places, investigating artefacts and locating them in time, I have developed an awareness of the ways we remember and preserve Scotland’s history. SOC 1-02a I can use primary and secondary sources selectively to research events in the past. I can make a personal link to the past by exploring items or images connected with important individuals or special events in my life. SOC 0-02a I can use evidence to recreate the story of a place or individual of local historical interest. SOC 0-07a I can compare aspects of people’s daily lives in the past with my own by using historical evidence or the experience of recreating an historical setting. 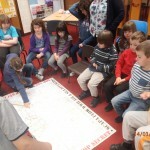 Through activities in my local area, I have developed my mental map and sense of place. I can create and use maps of the area. I enjoy playing with and exploring technologies to discover what they can do and how they can help us. I explore software and use what I learn to solve problems and present my ideas, thoughts, or information. TCH 0-03a I can access, retrieve and use information from electronic sources to support, enrich or extend learning in different contexts. I enjoy taking photographs or recording sound and images to represent my experiences and the world around me. Within real and imaginary settings, I am developing my practical skills as I select and work with a range of materials, tools and software. A comparison of work completed as part of the baseline and end point evaluations indicates a marked development in observation skills in both the older and younger aged pupils. 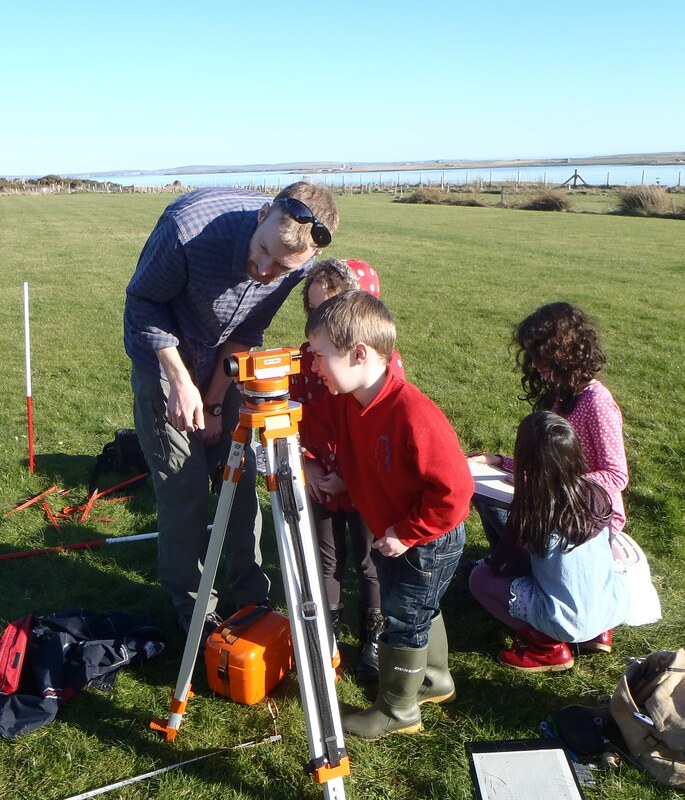 As evidenced in Figure 16, during the baseline survey pupils had a deep viewing range selecting points of interest in the far distance such as the oil flare on Flotta and the Martello tower at Hackness. The selection of distant features could be a result of not seeing anything of interest nearer at hand. The foreground points of interest that were selected tended to focus on plants, animals or familiar modern features such as a post box. The second poster, produced by the same Class 2 pupil as the first, displays a clear change in viewing range with far more close proximity features selected. Each of the illustrations has been labelled with an interpretation and all of them relate to sites investigated or visited as part of the project. 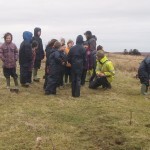 Skills developed over the course of the project were put into practice by all pupils during the end point assessment to a greater or lesser degree depending on the age and ability of the individual. 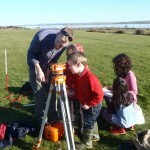 Generally speaking pupils were able to identify far more sites of interest (and notably World War Two archaeological remains) in the immediate vicinity to where they were walking than they had during the baseline evaluation and demonstrated high levels of information recall from previous classroom and outdoor lessons. The complexity and detail of knowledge retained was exceptional and evidenced through answers to questions, poster content public delivery at the exhibition launch and statements voiced during the end point evaluation. Formal feedback has been received from parents and teachers via questionnaires that were distributed in the closing weeks of the project. The response and comments have been very positive indeed indicating that the teaching approach has been well received by parents. Parental feedback also indicated that in all seven cases where the questionnaire had been returned, children had spoken about what they had been learning as part of the project and since participating in the project had demonstrated a greater interest in the past. 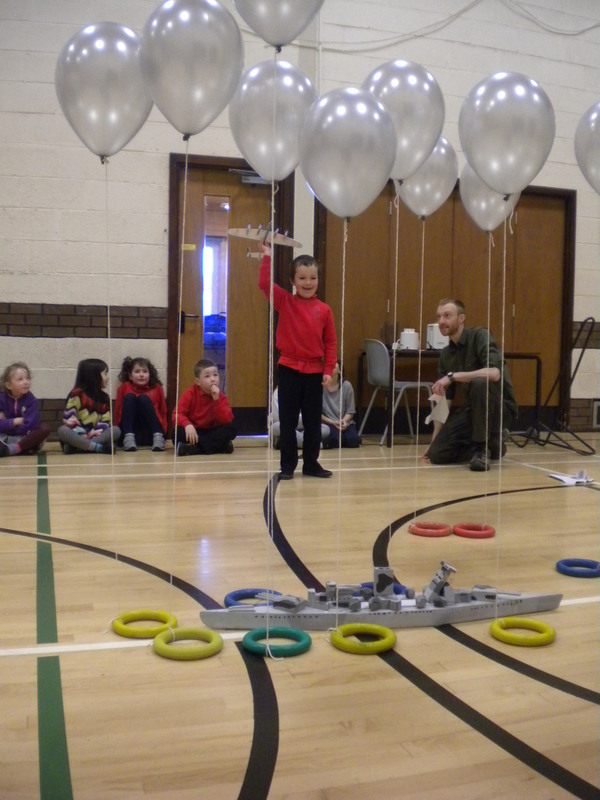 In 5 cases parents had recorded that children appeared more interested in the activities associated with this project than other school activities and all agreed that projects like this should be run in the future and be expanded into other Orkney schools. Teacher feedback was equally positive and emphasised the suitability of the applied teaching approach for primary level pupils with one teacher commenting that “the levels of discussions and insights from the pupils have been amazing.” The benefits brought from the project being delivered by an external individual such as the graduate heritage officer was also noted and although two members of staff indicated that they would be confident independently delivering a similar project in the future, all staff highlighted the value of having access to external expertise. All responses indicated that if a heritage officer was not available in the future then it would be worth exploring the possibility of staff and/or resource assistance from OIC’s Arts, Museums & Heritage Service. 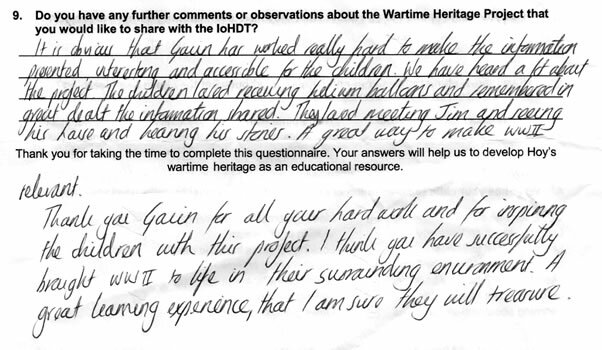 The results from pupil, parent and teacher evaluation all indicate that the primary school wartime heritage project has been a tremendous success. 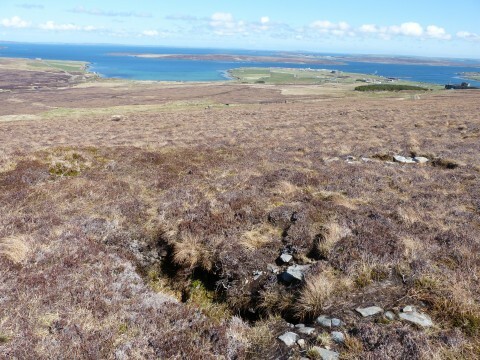 It has demonstrated that wartime archaeological remains, whether they are concrete bases, subtle earthworks or broken rusting artefacts, provide an invaluable physical source for educating and engaging the next generation about the wartime heritage of their island home. 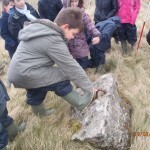 An archaeological approach has also shown its suitability for use with the Scottish Curriculum for Excellence enabling even the youngest pupils to engage with complex concepts and issues. As a final point, it is worth highlighting that during the project, the games of soldiers and pretend fighting that so often accompany the teaching of war themes at primary school level were entirely absent both in and outside of the classroom. This response would suggest that themes relating to conflict can be taught at an early stage in schools and processed by pupils in a mature way that doesn’t encourage violence or confrontational behaviour.